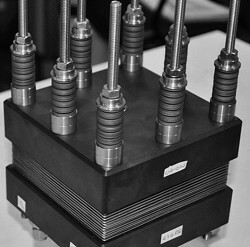 The research team’s activities concern the development and the characterization of materials for the conversion and the storage of the energy, particularly direct alcohol fuel cells, PEM electrolyser and regenerative cells. Developmen t of PEM Fuel Cells fed with direct alcohol or with organic combustible with low molecular weight for application in the portable sector, in the transports, for APU systems and for the generation of distributed electric energy. The activity concerns the design of devices with an elevated density of energy, the development of components with elevated performances, the increase of the duration and the reduction of the costs. Development of systems for hydrogen production from renewable energy. The process concerns the electrolysis of the water in devices that use protonic or anionic membranes. The study is inherent the development and the characterization of active components, particular catalysts for the evolution of oxygen and hydrogen, electronic supports able to assure elevated performances, high efficiency, stability to the corrosion and suitable costs. Development and the characterization of materials and components, as catalysts, membranes, electrodes and the design/realization of the devices.